I have always heard that Gianni Agnelli had a quirk for wearing his tie outside of his sweater. The other day ,while I was walking on the Hyeres boardwalk, I found a gentleman that not only shared this little style quirk but wore it with the same level of sprezzatura as l’Avvocato. When I asked to him to take his photo he politely declined (i think it was polite but i don’t speak French). Anyway, as I was trying to explain why i wanted to take his photo a young man that knew my blog saw i was having a tricky time so he stepped in and explained (in French) who I was and what I wanted to do. This wonderful couple is so cool! They are both holding onto their bags(she ofcourse has her prized Chanel bag)and he holding his walking cane and she to her umbrella.Love her total coverd sunglasses!You see,these are smart people protecting thier eyes from the harsh sun’s rays! Some of the looks you have been posting from Hyeres 2008 seem so posed and put together by a stylist,or do these nice sujects get it all right by themselves?Do you sometimes add or subtract something to get the look you want?Just wondering! They are so cute and tender!!! They are charming! !I love the sunglasses of Mrs. Languages open many doors maybe is time to learn one. Loving every bit of the pic! I wanna dress just as cool as her when am old! style its all about these little details..
Where I live in London, the most stylish and smartest men around are often older, usually retired, and always wearing a tie. I am not sure they would see themselves as doing anything other than simply maintaining standards, but they always lift my day. Love the look–I’ll give a try sometime. 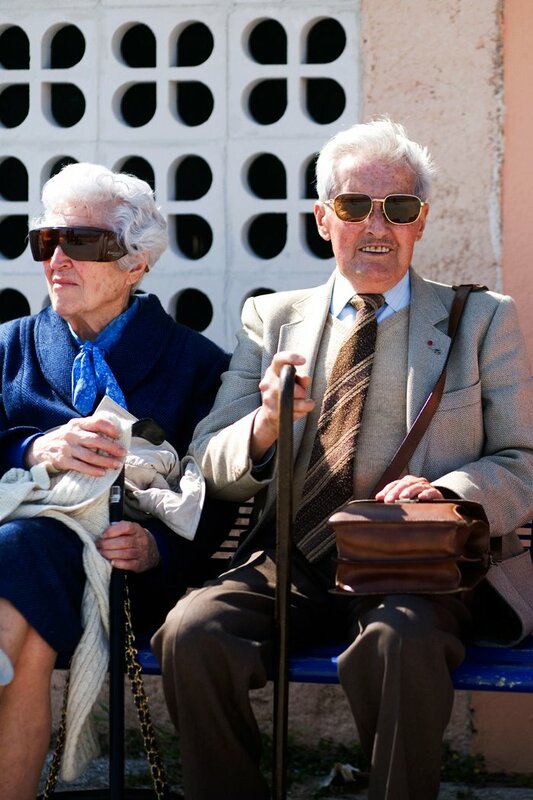 I agree they both have very cool shades – although the lady’s are not exclusively a fashion statement. I believe they may have a medical purpose and are used post-surgery for cataracts or glaucoma. We should all protect our eyes as well as she does! awwwww, such a lovely couple. but her shades totally blew me away. i kept wondering if she is kanye west´s grandma. lol. I would only add that I enjoyed the Agnelli history lesson. the madame’s sunglasses are called ‘blueblockers’, and yes, they protect your eyes and allow you to wear your glasses at the same time. i agree with the language thing. even if its just a few sentences in each language. it’s amazing how many doors you can open and how many smiles you receive when you attempt to learn a piece of another’s culture. especially the french, they really appreciate it. Lovely shot, lovely couple, and a nice story to boot. I think I saw music impresario Rick Rubin do this at an awards show and remember thinking, that is a very odd look. But now seeing it in this fortuitous photograph I am thinking that once I hit a certain age I might give it a try. One thing I often wonder when I look at these pictures is, What was that person thinking as they got dressed that morning? How did they make decisions about what to put together? It would be really educational to hear more about that, if you ever get the chance to ask! What I love is that the guy is wearing the tie out for himself. He didn’t expect to be seen or photographed. He’s not trying to set trends or make a statement. He just likes it that way so that’s how he wears it. I wonder if the same could be said for they guy with the track pants below, or for the guy with the ripped shirt and the folded-over belt below. I love his style from head to toe. Great sunglasses. Simple but elegant jacket. I love the quirky tie on the outside of the sweater. And the man bag is lovely. His wife’s navy coat is gorgeous. Quelle ensemble!! Great! Kind of has a little “Jack” to him. Nicholson not Daniels. A Rascal nonetheless. 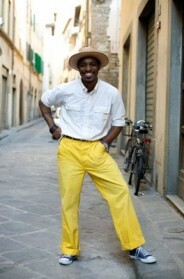 Would be something if he had on some Chuck Taylors with that. HA! I love old guys in sneakers. Mischievous.I’m sure it was a fine loafer from years past and worked perfectly.Thank You. Great pair that dress well! Wonderful. Both are classy and stylish. I adore her blue on blue ensemble; I can totally imagine them in the South of France enjoying their quiet days. and how wonderful that your blog is that well respected (not to mention well known) AROUND THE WORLD!! How fabulous is that?! Oh lovely, lovely, lovely! Yes, adore those Margiela-esque shades – style AND function rocks! And the shot overall is gorgeous how all the colours co-ordinate. Love the story too, bet you were thrilled to get that shot. I wonder if they will ever see it on your blog? Thank you for the info on the sunglasses! Good for you!! If you were in Mexico o Latin America or Spain and I’d be around, I would help you too! By the way, I love the scarf of the lady, beautiful blue!! Amen to what tj said. Love how they’re both rocking their own different colour schemes. look like they are taking a well deserved rest after a long 15 minute walk from their little old european car. I absolutely love little characters like this. It always reminds me of who we are inheriting the beauty of the world which is now from. preserve it!! my grandmother pairs these sunglasses with a large had and a little white bob ‘do. yes, they are for glaucoma, haha, but I think they just make this outlandish and hilarious statement, especially on a well dressed old dame. You dont have to be a “certain age” to wear a tie outside a sweater. As long as it works, (ususally with a V-neck) then pull it off. I’ve rocked the tie over the sweater and I work in the industry with people who think it’s wrong. It’s not. Its personal style & taste. This couple have beautifully shown both. Agnelli used to wear his watch over the cuff of his shirt as well. Maybe he had some outside/in fetish going on! I have to say…. I highly disagree with this man wearing chucks. i think that would entirely ruin the european charm and classic style that this bloke has. a perfectly polished little pair of loafers would be marvelous (hopefully matching his bag)- and I would love her to be wearing some little red pumps :). This is a fantastic couple. I wish I could hear the story of how they met and grew old together. I wonder if he’s wearing his watch over his cuff. Or if his decision to wear that was as thought out as Agnelli’s would’ve been. Either way… cool as a fan! I love her Chanel bag!! It’s so great to see it on a classy lady like the way it’s meant to be! I hope I can be awesome when I am old. Pictures like these give me hope for the future. I WANT TO LOOK LIKE THAT WHEN I GROW OLD! Hospitality à la France Sud. People are much friendlier there than in the more metrop cities. I also like the way l’Avvocato used to wear his watch over his shirt. On the topic of ties and sprezzatura, just wondering if anyone out there knows how to tie the “Barbaro Knot”, invented by Princely Count Vitus Sebastian Barbaro. I would like information on how to make it. Post if you know how.